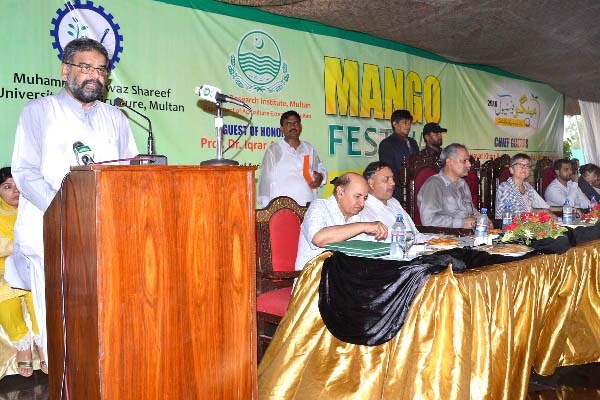 MULTAN, July 18 (APP): Federal Minister for National Food Security and Research Sikandar Hayat Bosan said that Pakistan had successfully explored new markets for mango exports. He said this at a two-day Mango Festival held at Mango Research Institute (MRI) hosted by Muhammad Nawaz Sharif University of Agriculture and Agriculture department Multan. He said the country was now exporting mangoes to Australia, Japan and South Korea besides other countries of Middle East and Europe. Bosan informed that there was a remarkable increase in export of mangoes. He stated the country had exported 10 to 12 thousand tonnes more mangoes as compared to the same period of last year. “We are focusing on small farmers as other progressive farmers have enough resources to enhance their income,” he added. He expressed the pleasure that there was no rejection of any consignment. Agriculture is mainstay of Pakistan’s economy and it is of 21 percent of GDP, he said and added that nearly 67 percent of our population was directly or indirectly linked to agriculture sector. “We are surplus in four crops including wheat, maize, sugarcane and rice,” he added. He also appreciated the cooperation extended by the Australian government for improving mango quality and quantity. He said that Pakistani mangoes are termed best due to its aroma and best quality. The work on establishment of disease free nursery is appreciable, he added. Australian High Commissioner Margaret Adamson, MNA Muhammad Khan Daha, VC Muhammad Nawaz Sharif University of Agriculture Dr Asif and others were also present on the occasion.